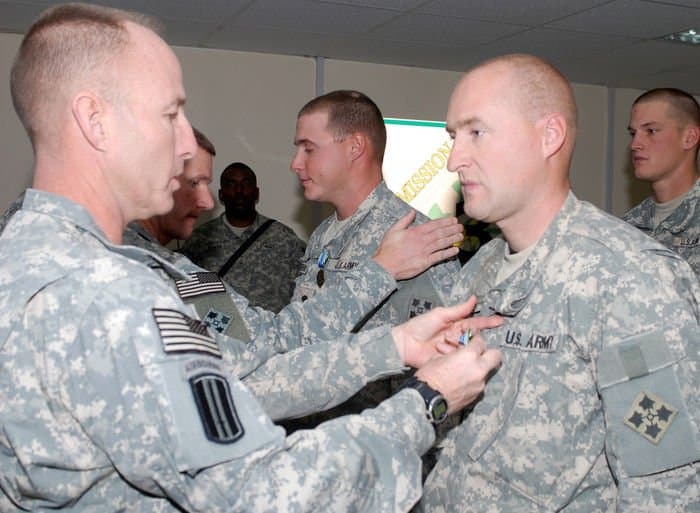 Fayetteville, N.C., native Col. John H. Hort, left, commander, 3rd Brigade Combat Team, 4th Infantry Division, awards an Army Achievement Medal to Boyertown, Pa., native, Spc. Jason Hildenbrand, a mechanic with Company B, 1st Combined Arms Battalion, 68th Armor Regiment, 3rd BCT, 4th Inf. Div., at the brigade headquarters on Camp Taji, Iraq, Jan. 20. Several Soldiers in the Striker Brigade were recognized for their efforts in bringing brigade vehicles up to operational standards after arriving here in mid-December. 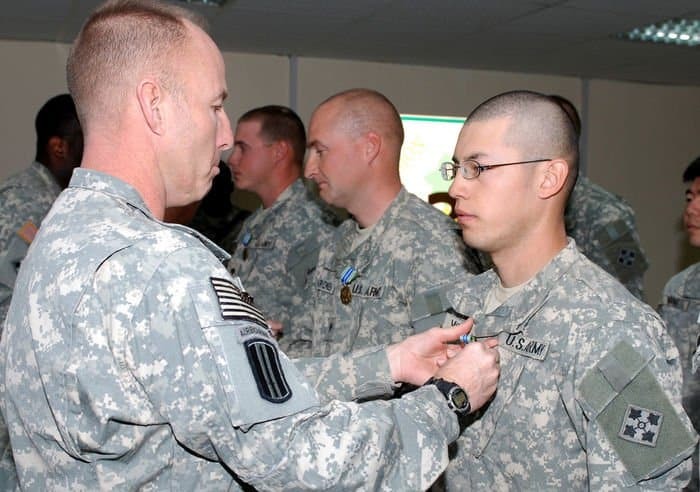 Fayetteville, N.C., native Col. John H. Hort, left, commander, 3rd Brigade Combat Team, 4th Infantry Division, awards an Army Achievement Medal to Wolf Lake, Minn., native, Spc. Chad Karvonen, a mechanic with Company C, 1st Combined Arms Battalion, 68th Armor Regiment, 3rd BCT, 4th Inf. Div., at the brigade headquarters at Camp Taji, Iraq, Jan. 20. Karvonen and several other Soldiers in the Striker Brigade were recognized for their efforts in bringing brigade vehicles up to operational standards after arriving here in mid-December. 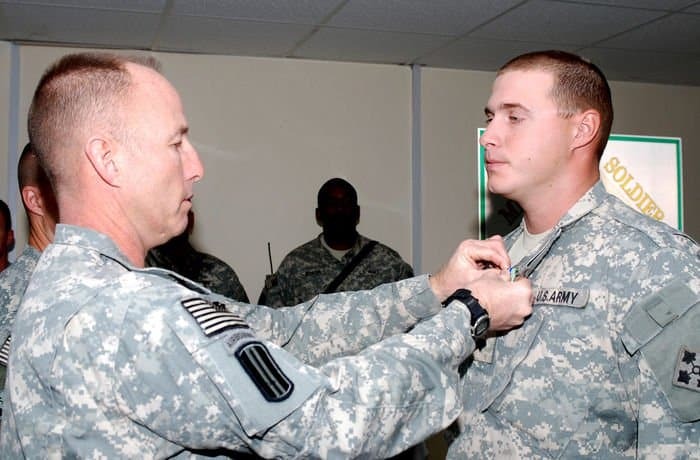 Fayetteville, N.C., native Col. John H. Hort, left, commander, 3rd Brigade Combat Team, 4th Infantry Division, awards an Army Achievement Medal to El Paso, Texas, native, Spc. Abraham Vargas, a mechanic with Company D, 1st Combined Arms Battalion, 68th Armor Regiment, 3rd BCT, 4th Inf. Div., at the brigade headquarters on Camp Taji, Iraq, Jan. 20. Several Soldiers in the Striker Brigade were recognized for their efforts in bringing brigade vehicles up to operational standards after arriving here in mid-December. 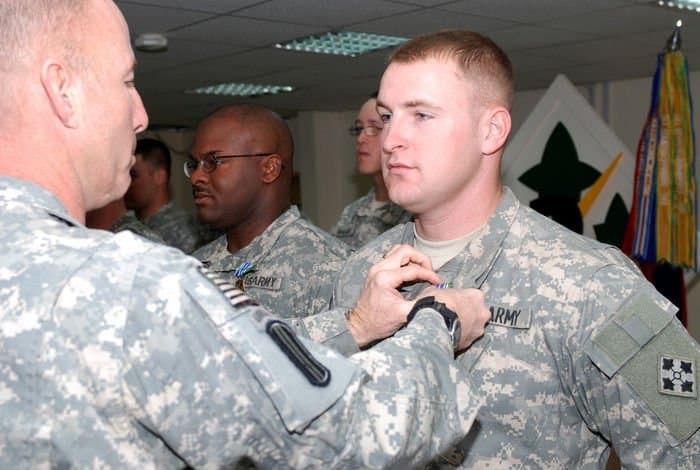 Fayetteville, N.C., native Col. John H. Hort, left, commander, 3rd Brigade Combat Team, 4th Infantry Division, awards an Army Achievement Medal to San Antonio, native, Spc. James Thomas, a mechanic with Company B, 64th Brigade Support Battalion, 3rd BCT, 4th Inf. Div., at the brigade headquarters at Camp Taji, Iraq, Jan. 20. Several Soldiers in the Striker Brigade were recognized for their efforts in bringing brigade vehicles up to operational standards after arriving here in mid-December. 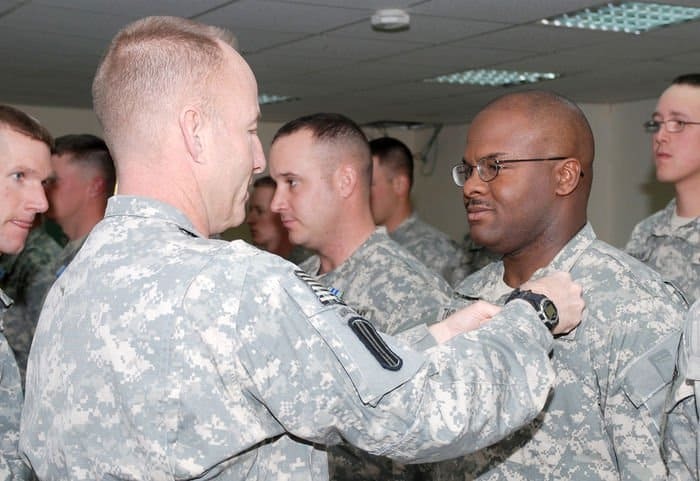 Fayetteville, N.C., native Col. John H. Hort, left, commander, 3rd Brigade Combat Team, 4th Infantry Division, awards an Army Achievement Medal to South Haven, Mich., native, Spc. Mike Milsap, a mechanic with Headquarter and Headquarters Company, 3rd BCT, 4th Inf. Div., at the brigade headquarters at Camp Taji, Iraq, Jan. 20. Several Soldiers in the Striker Brigade were recognized for their efforts in bringing brigade vehicles up to operational standards after arriving here in mid-December. Fayetteville, N.C., native Col. John H. Hort, left, commander, 3rd Brigade Combat Team, 4th Infantry Division, awards a brigade coin to Kansas City, Mo., native, Pvt. Greg Hill, a mechanic with Company B, 64th Brigade Support Battalion, 3rd BCT, 4th Inf. Div., at the brigade headquarters at Camp Taji, Iraq, Jan. 20. 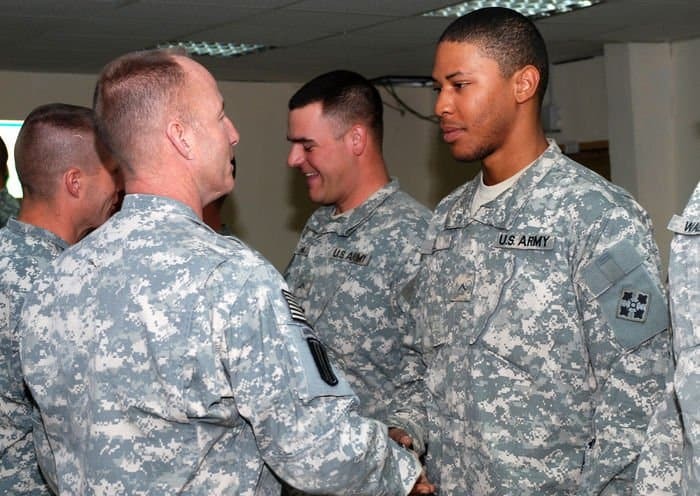 Hill and several other Soldiers in the Striker Brigade were recognized for their efforts in bringing brigade vehicles up to operational standards after arriving here in mid-December. Fayetteville, N.C., native Col. John H. Hort, left, commander, 3rd Brigade Combat Team, 4th Infantry Division, awards a brigade coin to Virginia Beach, Va., native, Spc. Daniel Walker, a mechanic with Company A, 3rd Special Troops Battalion, 3rd BCT, 4th Inf. Div., at the brigade headquarters at Camp Taji, Iraq, Jan. 20. 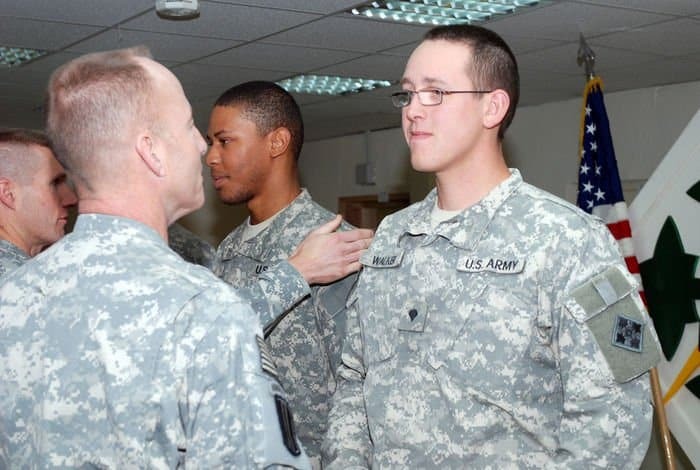 Walker and several other Soldiers in the Striker Brigade were recognized for their efforts in bringing brigade vehicles up to operational standards after arriving here in mid-December.